You’re not the only one noticing it: people are traveling more. Our national parks are seeing record numbers of visits; younger generations are citing travel as a top priority in their lives; and towns and cities that were once dormant locations are reinventing themselves to become the latest “it” spot for tourists. The reasons vary: maybe it’s social media, or the relatively cheap cost of traveling these days. Whatever is resulting in people traveling more frequently, we at Hemet Valley RV are stoked about it because RVs are seeing a lot of the love. With more people willing to travel frequently, RVs are being purchased and used much more frequently. Just last week, BusinessWire reported that 92 percent — nearly a hundred! — of RV users expect to use their RV as much or more than they did last year this summer. 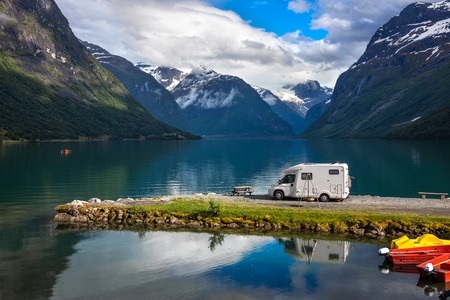 That will result in a record 25 million RV trips this summer, with more than 5.8 million Americans riding out this past Memorial Day weekend vacation alone. RV shipments, too, are at record levels. Majorities of RV users said they’d be using their RVs to get outdoors and enjoy nature more, take smaller trips, or spend some time with family. All of these are great reasons to use the RV that we at Hemet Valley RV can fully get behind. Many cited the desire to see America, new designs, and affordability as key factors—even with gas prices unpredictable each year, RV users said the prices didn’t affect them, as RVs would cost them less in the long run even if prices rise. This is extremely exciting news for us at Hemet Valley RV. For years, we’ve been telling customers that RV is the best option for that road trip you’ve been planning, or vacation you’ve always dreamed of. And now, we’re seeing a renaissance in travel that is bringing that vision alive. With that being said, here’s a salute to a summer of great travels, and memories. For any of your RV needs, don’t hesitate to talk with our experienced staff at Hemet Valley RV. We’ll get you riding into summer 2018 the right way. Contact us today!